Aston Villa top scorer Albert Adomah has acknowledged the debt Steve Bruce's in-form Championship side currently owe to fit-again Jack Grealish. Since replacing the injured Josh Onomah early in the 1-0 win at Middlesbrough on 30 December, Grealish has made six successive league starts in Villa's run of seven straight league wins. "Since Jack came back in, he's been immense," Adomah told BBC WM. "Even if he doesn't score, he produces magic. He creates things from nowhere." 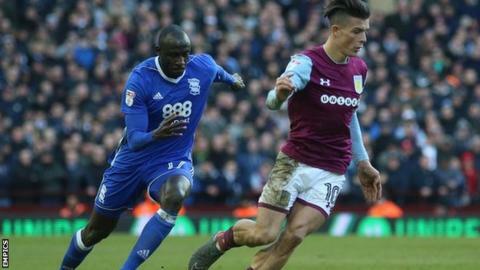 After running off a first-half hamstring injury, Adomah scored his 13th goal of the season in Sunday's 2-0 derby win over Birmingham City - fashioned by a clever left-wing pass from Grealish. "He's always producing assists," added Adomah. "It's down to the team that I'm scoring so many goals but, if I keep on scoring and the team is winning, then that would make most happy." Villa are on their best winning league run since also registering seven straight victories under Graham Taylor in 1990 - the season they finished second to champions Liverpool. In that seven-game run, they have scored 16 goals, kept five clean sheets and conceded just three goals, two of them to bottom club Burton Albion. Grealish is five appearances short of a century for Villa. Forty-two of those 95 appearances have come from the bench. He has scored 12 goals. In climbing to second in the table, the highest place they have been under Bruce, Villa assistant manager Colin Calderwood is also appreciative of the impact Grealish has had in recent weeks following an injury-disrupted first three months of the season. "His consistency of performance is especially pleasing at the minute, for all of us and especially him," said Calderwood. "He can bring out those moments of quality that catch the eye, but his recent involvement in recent games has been excellent. "We're very satisfied with the level and quality we showed against Birmingham. We controlled ourselves. We've produced what we believe we can produce on a derby day when the tension is high." Villa's next game is at fellow promotion challengers Fulham on Saturday (15:00 GMT).